Neuman S.P. Theory of flow in unconfined aquifers considering delayed gravity response // Water Resources Research. 1972. Vol. 8, N 4. P. 1031–1045. Neuman S.P. Supplementary comments on «Theory of flow in unconfined aquifers considering delayed gravity response» // Water Resources Research. 1973. Vol. 9, N 4. P. 1102–1103. Neuman S.P. Effect of partial penetration on flow in unconfined aquifers considering delayed gravity response // Water Resources Research. 1974. Vol. 10, N 2. P. 303–312. Neuman S.P. Analysis of pumping test data from anisotropic unconfined aquifers // Water Resources Research. 1975. Vol. 11, N 2. P. 329–345. Neuman S.P. Perspective on «Delayed yield» // Water Resources Research. 1979. Vol. 15, N 4. P. 899–908. Moench A.F. Computation of type curves for flow to partially penetrating wells in water-table aquifers // Ground Water. 1993. Vol. 31, N 6. P. 966–971. Moench A.F. 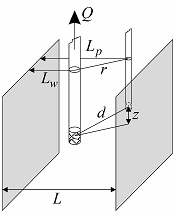 Flow to a well in a water-table aquifer: an improved Laplace transform solution // Ground Water. 1996. Vol. 34, N 4. P. 593–596. 1) when screens of partially penetrating wells have different elevations. Parameters matched for the case of isotropic aquifer are: k, S, Sy. Parameters matched in simplified solution for water table drawdown are: k, a (non-leaky aquifer) or k, a, B (leaky aquifer). Parameters matched for confined-unconfined aquifer: T, S, Sy.